Our Driver and Car will meet you at your hotel in HCMC, and transfer you to Tan Son Nhat Airport to catch the direct flight to Phu Quoc Island. On arrival, you will be met at the airport for the transfer to your chosen hotel (with guide). The remainder of the day is free. Overnight at your hotel on the island. After breakfast, your car and guide will meet you at your hotel and take you for a tour of palm fringed pristine white sand beaches, and the fishing port at An Thoi. Take a break for lunch at a local seafood restaurant, offering local specialities. After lunch, visit a pepper plantation or a fish sauce factory as Phu Quoc is famous for its excellent quality black pepper and world beating fish sauce (nuoc mam). You will be taken back to your hotel. After an early breakfast at your hotel, you will be met by our driver for the port transfer to catch the hydrofoil to Rach Gia on the mainland. 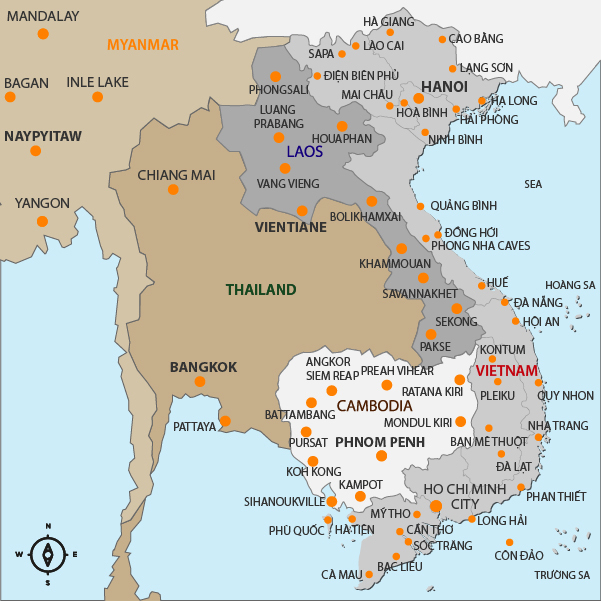 From here to Can Tho is approx. 170km, and you will pass through some amazing scenery of the Mekong Delta and have lunch en route in a local village. Once in Can Tho, jump on a Xe Loi, a type of cyclo unique to the region to travel to your hotel in true local style for your overnight stay in Can Tho. After an early breakfast at your hotel, board a cruise to Cai Rang Floating Market, a bustling and lively trading hub. We visit a local family at their fruit farm and learn about their methods of cultivation. Continue cruising down the vast stretch of canals before being picked up by our driver and car. Lunch is taken en route back to HCMC and we drop you off at your hotel at approx. 17:30 when the tour ends. INCLUSIVE OF: Private transportation with A/C, English speaking guide, Hydrofoil from Phu Quoc Island to Rach Gia, Boat trip in Can Tho, Xe Loi, Entrance fees, Meals as indicated (3 Lunches), one bottle of mineral water & wet tissue on during day tour. EXCLUSIVE OF: Accommodation in Phu Quoc Island, Domestic flight from SG to Phu Quoc Island, Other meals, Drinks, Travel Insurance, Visa, Personal expense & Gratuities. Above 9 years old: Apply the same price as an adult. From 4 to 9 years old: 50% of an adult tour price. From 1 to 3 years old: Free of charge (only 1 child). Please note the age of the child(ren) on Additional Information Form. All children must be supervised by an adult at all times during the tour. This tour brings you to the beautiful Nha Trang beach and Dalat, "Le Petit Paris" located 1,500m asl on the Langbian plateau. Full Day Enjoy the daily trip to Cham island with fun, snorkeling, relaxing and lunch. Joint group tour /SIC. Full Day Enjoy the daily trip to Cham island with scuba diving for beginners. (NON – CERTIFIED DIVERS) Joint group tour /SIC. Full Day Enjoy the daily trip to Cham island with scuba diving for certified divers. Joint group tour /SIC. 2 Days / 1 Night Enjoy the 2 days trip to Cham island with snorkeling and island excursion. Joint group tour /SIC.